You’d nearly have to admire them. Nearly. 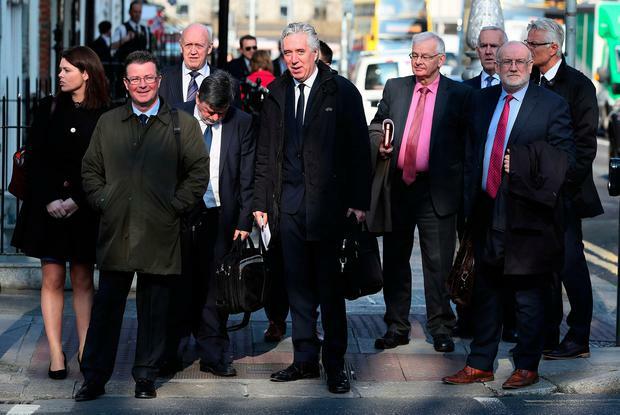 For instance, we’d love to know how much the exact expenses were around the nine members of the FAI to show up in the Dáil for the day – what with John Delaney refusing to answer any relevant questions, with Donal Conway hung out to dry so he had to play plenty dumb in answering what no one ever asked and not answer what they did, and with the rest as mere seat fillers. But the primary wonder was how the executive vice president actually got in the door with such a pair. For this was an astounding showing on Delaney’s part. One where even he went to new lengths in terms of evasiveness and disdain for any and all others. In the time-honoured tradition of Irish accountability, he quickly laid down and played the victim to the point that you thought if only he’d run Irish soccer for 14 years as well as he ran rings around those seeking the truth, and we’d be in a far healthier state. However, don’t forget that such an approach was through knowledge of systematic political barriers that meant the FAI didn’t have to be there, never mind be anyway helpful. For sure there are limits as to what those elected can do – with Ruth Coppinger, Pádraig Ó Céidigh and Jonathan O’Brien not getting where they deserved – but there was often a lack of drilling down where needed. This column has again and again pushed problematic accounting practices. There’s the concept that an invoice and a loan are separate bills, meaning technically €200,000 was owed to Delaney. There’s the wonder why an employee would invoice his own company “for services” when revenue prohibits it. There’s the fact that the €3,000 rent per month was not put through payroll and taxed as income, with reports saying Delaney accounted for it as benefit-in-kind. Remember that lack of clarity shouldn’t release pressure, rather increase it. Thus, since the FAI didn’t want to get real here, it must be made to. It’s why the Office of Director of Corporate Enforcement and a Public Accounts Committee need to come in. There’s another reason too that became clear when three times chair Fergus O’Dowd asked Conway if the FAI would agree to a full and open audit for all to see. The president’s rambling qualified as a refusal to offer up a little more openness than the mafia. By now this shouldn’t be just about Delaney, as tempting as that is after his effort had him come across a surly teenager. His actions may have cornered those he for so long shared a board with, but they played along and their answers showed many up for what we always suspected. Seven of the members have been there for a total of 103 years yet you couldn’t trust them with a bake sale. Therefore if Delaney now badly needs to be escorted to the door, he must play the familiar role of Pied Piper. For examples around why, it was originally said the board knew nothing about the €100,000 but on Wednesday they didn’t know where this had come from as no one said the press release was on them. Then Conway admitted at the time of the transaction that three knew. Then it was noted that the entire board were “familiar” with it. When it was asked why such a significant piece of information wasn’t included in the minutes of such a meeting, we were told “it wasn’t discussed at the board”. Finally the reply was “it was managed the way it was managed”. Conway has been a board member himself since 2005 and couldn’t even muddy the waters. It instead left us looking clearly at incompetence. The FAI and all their experience, it seems, were stumped by the idea of basic cash flow charts, and budgeting accordingly for times of abundance and times that get a little lean. Later we learned that a €100,000 loan from the personal account of the CEO didn’t make that month’s financial report. Later still it came out they’ve a total of 24 bank accounts. And when asked why the new CEO won’t be on the board when Delaney was for an eternity, the 17-year-old Genesis Report came into the mix. Despite the attempted hindrance, it was so, so damning. Such tactics of running and hiding cannot be allowed to continue, and these tactics aren’t cheap. Particularly for a business that had to borrow from Delaney and not report it. Maybe it’s coincidence but since the news of that financial irregularity – on the back of a previous audit where Deloitte we can only presume weren’t informed therefore didn’t include it – now comes an army of others. There’s been a report by Jonathan Hall & Associates into the restructuring of their governance, there’s an internal audit by Grant Thornton, and soon another investigation by Mazars. In terms of Hall, we hope it wasn’t expensive. Twenty-five per cent of their findings section is a list of the 11 positions that make up the board, while so much more of their report pushes for Delaney’s new role to be created, him to be immediately installed with no interviews, him to be granted key jobs, and him to be given cushy numbers like selling the FAI to the diaspora particularly in the USA. In terms of Grant Thornton, the FAI confirmed the findings are private. If Delaney and, by extension, those around him, want to treat the public with contempt, it should be reciprocated. The pocket is where it hurts most and that’s why this needs to come back to sponsor pressure and to senior game ticket sales. Also, it’s widely known that if his time in Irish soccer is up, Delaney will try to hold out until 2020 so he’s eligible for that Uefa vice-presidency. Does he deserve such patience and help though? We can blame him for a lot. What we can’t do is keep giving him a path to continue on down.